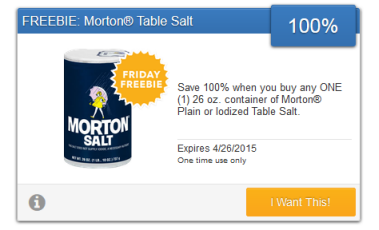 Today’s SavingStar Friday Freebie is for Morton Salt. This offer is good thru 4/26. Simply log into SavingStar, select the offer then go and buy Morton Plain or Iodized Table salt and submit your receipt thru 4/26. SavingStar will then give you cash back (see site for details) for what you spent. You can buy the Morton sale at any sotre.